Sigstr is a cloud-based application built for marketers to use employee email signatures as a new marketing channel. Setup is simple and instantly appends campaigns to the signatures of every employee in your company. Easy to use and effective app that plays a great role in our marketing and outbound efforts. The team is always super quick to respond and have been great to work with. We're looking forward to seeing additional releases and expanding as our team grows. The ABM component of Sigstr will also become more critical for us as we scale our own efforts. Nothing -- we're happy with the service and look forward to seeing continued innovation. Take a look at their full suite of products -- lots of cool stuff to consider. We use Sigstr to promote events, new features and new partnerships/integrations. It's an easy way to get everyone on message with what we are promoting. We have also been able to A/B test many of our signatures / messages to see what resonates with people looking at our own product. "Subtle and unique way to further engage prospects & customers"
The tool's interface is really intuitive and easy to use. It's great that you can upload multiple image versions to keep a campaign fresh to run for a longer period of time. The analytics are great - you can even trace back to exactly which user sent an email that led to a conversion, which is info we always share; it's cool for them to know the tool is working and that they're a huge part of it. Also, our Customer Success Manager is incredible and constantly goes above and beyond. She is always willing to help and make suggestions when we need them. Their support team is incredibly responsive as well. ABM campaigns always trump sender-based campaigns. Also, I wish you could make ABM campaigns only applicable for a specific group of senders (so essentially a combo of ABM/sender-based campaigns). Take advantage of your CSM! They're so knowledgeable and always willing to provide feedback and help. Also, allow your users to provide campaign content suggestions; our users are the ones communicating with prospects and customers, so they know better than anyone what these people care about. We needed new ways to engage prospects and customers with marketing content without causing list fatigue through excessive email blasts. Sigstr allows us to subtly promote content and solutions through our support, account managers, and sales reps who are in constant communication with prospects and customers. We've also realized it's a good way to promote content and offers to those in our database who have unsubscribed from marketing emails. I like how quick Sigstr is. When I want to preview a banner, the display is quick and accurate to what it will look like in an actual email. When I update my campaigns, the change is almost automatic. I appreciate that aspect, as well as the change they recently made to allow more than one banner per campaign. I don't like that I can't A/B test. I can put multiple banners in a campaign, but can't see feedback if one is performing better than the other. We use Sigstr to increase awareness of new products and events we have going on. We attach campaign banners to Sales, Marketing and Customer Success employees to help gain visibility to our products and events. "Great Platform for Enhancing Your ABM Efforts"
One of my favorite things about Sigstr is their ABM capabilities. Being able to run more than 290 ABM email signature campaigns in their platform really extends our ABM efforts into another channel. It also allows for us to have a consistent drumbeat message across every channel we use for our marketing efforts and further show the level of personalization we have in every aspect of our sales process. And, it's extremely easy to get all of these ABM email signatures setup in their platform. I have no complaints, but I'd love to see ongoing enhancements to reporting capabilities. Sigstr helps us manage both our employee signatures as well as our ABM email signature campaigns. We onboard all new team members on Sigstr on day one at Lumavate. As a marketer, I love having the ability to control our brand across all our email signatures to ensure brand consistency. It has also unlocked a brand new channel for us to promote high-impact, real-time campaigns. While Sigstr has made great strides in their analytics, that would be the one area for greatest improvement. I know they have plans to continue to make their analytics world-class. The analytics they do provide, though, are still far beyond anything you have had for 1:1 employee email in the past. If you are in sales, marketing, HR, or customer success, Sigstr feels like a no-brainer. It's an extremely low barrier to entry, so I highly recommend. Especially with their new Dynamic Campaigns feature, I'm able to personalize campaigns based on recipient and get the right content to the right audience at the right time. Sigstr solves for brand consistency across our email signatures and an easy way to promote new content via an owned media channel. It's driven a number of inbound leads and brand awareness for the content we're already developing. "Results on day one - Sigstr for the win!" UPDATE 12/21: we've crossed one MILLION signature views! With over 100 employees now, I'm so happy we're leveraging Sigstr to get in front of so many people. Today, we updated all our signatures to have our holiday hours in them which was super helpful. I keep finding new, great ways to use Sigstr and seriously can't say enough how much I enjoy using it. UPDATE 6/5: The Sigstr team is killin' it AGAIN! I realized today as I had a few users using non-Gmail email options that the password requirements were 12 characters but you couldn't see the characters as they typed. With 12 characters they kept messing it up and the confirmation one didn't match. I tweeted @ them and within hours they had not only replied to my feedback but actually MADE THE CHANGE!!! I love these guys. They are SO on top of things and are constantly improving their product and they are an absolute joy to work with. After 20+ inquires about "what should our signatures look like?" from employees around our company I knew it was time for a solution. Sigstr saves me time so I can focus on important marketing initiatives instead of jumping into everyone's email accounts to help craft a consistent signature! UPDATE 12/21: i wish i were better at creating signatures or that they had a tool to help me do it - i heard a rumor that may be in the works though! It's a little slow to load sometimes but I'm a super fast user so I'm not surprised by that. I also am having trouble finding a way to get it consistent for all my mobile users with Gmail on an Android. It's SO worth the low cost to have this amazing, time saving, branding solution! Their support team is seriously the best I've ever worked with and they are constantly making improvements. They actually take feedback seriously and use it! Oh man - first we just saved ourselves a ton of time. Also, we're able to keep our branding consistent. Finally, we've already started getting registrations for our next webinar from the campaign in our signature and it's been live for less than a week!! "Effective Marketing That's Easy to Use"
Sigstr's web app is so simple to use that implementation of this tool takes only moments. Once you purchase, you can begin using immediately. There is definitely room to enhance Analytics, especially targeted toward customer and prospect-facing people who want to know if their emails are being opened and read. There is also room for improvement in the user experience of the web app, primarily in the "Schedule" functionality. The feature works as expected, but with some UX nuances. Finally, I would love a true Zendesk integration to include Sigstr campaigns in our Zendesk tickets. It's a no brainer. Just purchase Sigstr and get to making your new campaigns! Be sure to switch your campaigns often so they don't get stale, the scheduling feature is great for this. We segment our Sigstr campaigns into three categories: customer-facing teams, our support ticketing tool, and prospect-facing teams. The content of the three campaigns varies at any given time; we educate customers on new features, ease of use, and training materials, we include FAQ documentation in our support ticketing tool, and we use revenue-driving content in our prospect-facing campaigns. "Straightforward and functional solution for signatures with great support"
Ability to set up employees in groups, ability to set time-limited email campaigns, overall ease of use and functionality, easy import of lists, and above all... great, responsive, caring customer support people who really go the extra mile. The one feature I'd like to see would be the ability to put employees into a group temporarily. But this is not a serious business requirement at this time, just a nice-to-have. Sigstr was the third email signature management platform we tried, and the only one that met our needs. The majority of our users are on Outlook 2016 for Mac (desktop edition), and that was the sticky point: none of the other solutions could work with that platform. Sigstr worked with us to make 100% sure that their solution worked for all of our users before we ended the POC phase to become a fully fledged customer. Now that we are, our signatures are attractive, consistent, and centrally managed. "Well designed, untapped, egagement avenue." The concept, giving all emails essentially a secondary CTA is incredibly valuable. With a company of 300 in multiple cities, we're using it for an internal communications tool as much as we are for external campaigns. We've seen aggressive development with their product and integrations in only 12 months (specifically, marketing automation tools) and we love to work with companies that want to keep making it better. Once the key attractions to Sigstr was their "seamless Outlook integration" and that was rocky at first. Let me say, the company handled it very well. We have HIPAA regulations and make our data import/export/software updates not straightforward. It took time and was a project, but they rose to the occasion. We have a largely remote sales force and experienced problems installing and updating the software on some of those devices--trying to devise an automated process that we wouldn't have to rely on each PC user to do by hand for every update. Look closely at your planned integrations in terms of staff coming and going from the company, fields like credentials and misc info to be displayed. You will be customizing your Sigstr experience more than you think, but, they are very helpful. It's been an amazing internal communications tool for us. We launch the company newsletter that way, announce wellness campaigns, call for charity participation, solicit feedback and resources from our multi-city and remote staff of 300. From an external perspective, we're just now looking at all the capabilities of integration with our marketing automation (HubSpot) and devising its role in the lead-gen process. The prospects are good. I love how quick Sigstr Support responds to my requests. Each employee I've been in contact has been extremely friendly and helpful. Sigstr is simple to use, and easy to explain to new employees. Not only can other employees set their own signature up, but I am able to monitor their signature as an Admin to make sure all of the info is correct. Having to email Sigstr Support in order to upload an avatar is the one thing that I dislike. Each employees signature looks the same, is easier to do, and they can set it up so marketing doesn't have to! With Sigstr, we're also able to keep track of how many people click the banners. Awesome! "If your company sends out emails to customers and prospects, then you need Sigstr. " Sigstr not only is extremely easy to use, it also allows you to customize clickable art work embedded in your email signature. Furthermore, you can customize who from your organization sends what Sigstr in their email signature. Sigstr spruces up your plain text emails by providing a "call-to-action" image that attracts email recipients to click on it. Lastly, Sigstr provides analytics reports on different campaigns, views, and clicks allowing you to analyze objective data. I honestly have no complaints, Sigstr provides us with everything that we need. Again, if your company sends out emails to either customers, prospects, or both, then you should invest in Sigstr. It is a tool that provides minimal effort, but offers high reward. As a company that relies heavily on email marketing, Sigstr has extremely benefited our marketing efforts by attracting more prospects and customers to click on our Sigstrs which navigates them to our content and website. Furthermore, we are able to take out the guess work on how our emails are performing by analyzing Sigstr's analytics reports. "Reliable and effective marketing tool"
The simplicity of the tool. It takes just a couple minutes to launch a new campaign and update the email signature of all of our sales reps. I also really like that changes take effect instantly, resulting in quick results when we make a change. I wish their was a non cloud version so that our IT group would allow wider use of the tool. It is a great tool but we have had challenges with our IT teams allowing us to expand our user count. Give it a try with a small sample of users and expand from there. Communication of new products, events, and campaigns. We have found that it not only helps our customers see and engage with what is going on, it also helps our sales team know whats going on because they see the banner in their emails before they send it. "Great Product. Easy to Use. No brainer value-add"
Sigstr turns employee email signatures into a powerful marketing channel for us. It's super easy to use and drives results from day one. It's easy to segment your campaigns and target different audiences. We recently upgraded to the pro plan and I'm really excited about the added ABM functionality and other useful features. It's an absolute no-brainer. Employee email signatures may be one of the most under-leveraged marketing channels. Sigstr makes it really easy to harness this power and drive incremental lift in clicks and conversions. We are driving incremental lift in qualified traffic and conversions using Sigstr. It's a channel that touches hundreds of thousands of people every year (millions if you're a bigger company). Sigstr makes it easy to engage with your prospects, customers, and employees in a brand new, effective, and fun way. "One of the best ABM tools in our Sales and Marketing stack"
Sigstr's ability to display dynamic email signature banners, depending upon the email recipient, is vital to our holistic account-based plan. Sigstr helps our prospects unearth custom content that we've created for their account, organically through our email exchanges. We promote a variety of direct content and content micro-sites to the accounts directly within the email, highlighting our desired partnership with them. One thing I have realized was that by remotely and retroactively being able to update the banner image, call-to-action, and destination URL, you can constantly keep your accounts up to date with the latest content or announcement, whether they're opening your most recent email, or your first. The omnipresence of the signature banner gives your prospects a one-stop shop for finding the best content from you and your team, created and shared specifically for them. More integrations with more pieces of our sales/marketing stack would be ideal, but I believe they are coming down the road. We use Sigstr for personalization. ABM is hard to do on scale. Sigstr makes it so that we can ensure every account feels that we've gone the extra mile for them, presenting them with content that is relevant and valuable. "A key addition to any ABM strategy. Love Sigstr and it's impact!" Super fluid to implement and start to realize amazing benefits and impact from the start. We started with an initial 200 employee launch and it was very easy to get the initial campaigns created. The first surprise was the volume of impressions to our signatures and the level of impact. The second great surprise was when we rolled out Pulse and understanding the relationships across accounts that helped us better understand who and where we have the strongest relationships within an account. As a customer I've also been appreciative of the strong partnership and collaboration with the team. They've listened to feedback and we've seen some of those suggestions quickly make it into the product. Nothing significant at this time. A recommendation to new customers would be to ensure that all campaign creators align on the image banner dimensions to prevent rendering issues across conversations. Ability to run campaigns against specific recipients and accounts, measure engagement with signatures & relationships within specific organizations. Key benefits have included the engagement from both prospects and existing customers with the banners. The performance equals and in some cases surpasses even the performance of targeted display ads to accounts across other external ad networks & linkedin. Set up as an admin was fairly simple and Sigstr's Customer Success and other Technical Support personnel were able to get a good portion of our environment ready in a short time frame. The product works great with a little tweaking of Office 365 connectors and transport rules, in my company's case. Since we were early adopters of the product, my only quibble would be that a lack of knowledge base articles forced me to reach out to TEchnical Support, but they gave great support and got me on the right track immediately. For Marketing and brand image, it has really made a difference for us. Making all signatures uniform across the board for all our divisions send a good message to our customers and vendors alike. We're also excited to see how Pulse add to an already great solution. "Great way to target high-value clients & prospects"
The platform makes it easy to tailor messaging to top-tier clients & prospects. You can revise your target lists anytime, and put promotions in front of them that are 100% specific to each account. We didn't revisit and adjust the target lists as often as we should have, but it wasn't a limitation of the system. It was just an oversight on our part. So maybe there could be some kind of prompt to remind users to review the lists being used for ABM. It has helped us to promote content and events to prospects. It provided an outlet to recognize our clients and serve up messaging just for them. "Sigstr - Control your company's brand"
The best thing about Sigstr is their easy to use platform to control the signatures of all employees. I never have to wonder if our brand is being represented well. I also love the ability to see who's using the software the most. It basically shows me who my "brand advocates" are without having to convince people to be one. The integrations with our email platform was a bit cumbersome in the beginning. But they've come a long way with integrations and I know they are still innovating and improving on them. We send so many emails per day. By using Sigstr as a marketing tool we are informing our current customers about new updates while also informing prospects about what we offer. Its a great tool and has a lot of potential to add to our marketing efforts. 👋 Hi Elizabeth – Thank you for reviewing! We’re so excited you are seeing the value and the platform’s ease of use. Sorry to hear you had a bit of a cumbersome experience at the start – but like you said, we’ve come a long way with our implementation methods (as well as integrations)! We currently offer seamless solutions across all email clients and environments – our team is always working hard to make the implementation process as simple & smooth as possible! When you are ready to roll with a new campaign, webinar, message, promotion, whatever - you go to one place, Sigstr, and immediately your entire field is promoting on every email they send. No mass requests to change, it's centralized and pushed out to everyone automatically. I'd love to dig in more to "how can we get more clicks' with out messaging - or better yet, how are we doing compared to others? The problem was the coordination and communication required to get our field on the same page with the latest "message". Sigstr took care of this - immediately put time, maybe not tons of time, but time nonetheless back into the fields hands. It also increase visibility to webinars, etc. from a trusted source as it's coming through on an email from someone our prospects know. The tool itself is really valuable for the marketing team to ensure consistency and also be able to promote different events and campaigns. Before Sigstr, I created my own images and had to tell the team to add it to their signature, a very repetitive process. Now I can change these campaigns myself and also assign different campaigns to different teams easily. The customer service at Sigstr is also top notch! We had a lot of technical issues at the beginning, but the team worked hard to fix them. Our email sometimes runs slower, which may or may not be related. We are using Sigstr to promote events, webinars, and content in a way that touches more people, more often than a generic email blast. It has shown us the importance of consistency in a growing organization. "Outstanding team support during the entire process!" Sigstr allows hyper alignment between our Sales and Marketing departments, marketing can work in collaboration with our sales team to drive awareness to content in a very targeted matter. There's not anything that comes to mind that we dislike about Sigstr. For those considering Sigstr, it's a great way to align with sales on marketing events as well as solidify ABM initiatives. We are able to have branding consistency across the board while dynamically changing email banners based on senders or recipients. One of the benefits we have realized - Sales Reps are really excited to promote content and events since its integrated into their everyday cadences. SigStr is really easy to use, manage, control and deploy email signature campaigns. Centralized control of what shows up across all our emails (marketing, sales, support, customer success), is important for us - both to drive engagement as well as ensure how our brand is represented. Groups has helped us promote different campaigns across global geos. We are are G-Suite setup, so most of the users use Gmail and SigStr works seamlessly. But there are a few, who use Microsoft Outlook and Apple Mail - need SigStr to help support other email clients too. Actively promote new campaign/content offers. Bring consistency around how our brand is represented in emails. We have seen significant increase in engagement through our emails and now can be measured because of SigStr. 👋 Hi Kaushik – Thank you for reviewing! We’re happy to say we offer implementation methods for both Outlook & Apple Mail – Feel free to get in touch with your Customer Success Manager to talk through how to get those users set up! "Low conversion but great touchpoint for a low price"
Easy to swap new banners in and out. I like the groups feature. The banners have a low conversion rate generally no matter what banner we go with, but for the price it is worth it. This fact also makes testing various banners often a low-risk venture. Would love more insight as to who is clicking the banners even if they are not converting at the landing page. Test and test and test and test. Don't get lazy and get stagnant by letting a banner run for too long. Basically expanding our brand awareness is the most basic use. We hope for lead generation and to get a better understanding of what customers need and are looking to learn about from a digital marketing perspective. "Effective, efficient, and easy to use marketing program "
I love the standardization it brings to email signatures within our organization. We've used Sigstr as an effective way for our organization to promote events, spotlight strategic new hires, and debut our new company website. It's been very easy to use, and the support has been great as well. We have a number of users on Mac's, and have had a hard time with historically with some signatures updating. I believe the issue has been resolved. We don't have a dedicated marketing team, so this is an easy and quick way for us to get information across to our clients, much easier than a newsletter, or other method. We also like that it ensures a standardized brand presence via email from our workforce. "An Amazing Solution to Keep Everyone on Brand"
The ability to manage everyone's signatures, maintain brand consistency, and unlock a new marketing channel. Implementation took longer than I would've liked and was a bit of a frustrating process. Prepare for a lengthy implementation period with them, as well as know that it will take awhile to get everyone to adapt to using it. With multiple brands, it was difficult to keep everyone on their respective brands, and maintain a level of consistency with our signatures and branding. Sigstr definitely solved that problem and more. "Great way to promote content or messaging across teams and organizations"
Sigstr is a slick and simple product that makes signature management really simple so Sales doesn't have to worry about formatting signatures so the entire team looks professional and consistent across the board. While I love the platform, I really wish users could be in multiple groups since we have a few cross-functional people that don't exactly fit into one sales bucket or another. Sigstr makes both of these issues that I've encountered on multiple marketing teams really easy to manage. The customer support team at SIGSTR is by far the best. They are friendly, helpful, and very knowledgable. I rarely have an issue, but when I do, I know the team will quickly resolve the problem. As the application changes, the team does an outstanding job of communicating the upgrades as well as providing tools on how to use the new features. I have been incredibly happy with SIGSTR and how easy it is to implement. I don't have any critiques that this time. We now have a way to effectively communicate multiple campaigns at one time across several markets. We benefit from real time tracking and results that track the success of our campaigns. "Easy to use + great customer service"
The software is super easy to use. Setting up campaigns and signatures for my team only takes a couple minutes. The best part is no one has to update anything! I love that I can schedule campaigns too - it's a small time saver but, more importantly, it's something I can set and forget. Though setup is easy, there always seems to be 1-2 team members that can't get it downloaded. It's always fixable, but just a hiccup. Also, the reporting could be more robust. I'd like to see who clicked on my campaigns and when they clicked. It's worth every penny! 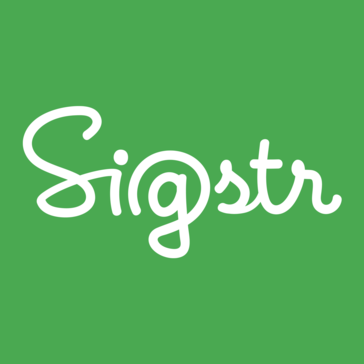 If you're not already using Sigstr, I recommend you sign up today. Sigstr allows our company to promote a consistent brand image with each email signature. And each time an email is sent, we have the opportunities to generate leads. Employees are empowered to update their own title and phone #. "One of our most powerful digital channels by far." We are able to capitalize on the trust that the sales team has gained with their coaches and contacts within customer sites and target those customers with relevant marketing content. Any gripes we have raised with the team have been so quickly addressed that frankly, it's amazing. Their team is even working with our extended digital team to craft the next version of their enterprise level solution. We truly feel like a partner. Absolutely, would recommend to anyone who wants to gain another owned marketing channel - Very affordable solution and absolutely worth it. How do we insert marketing material into the selling process at the right time and to the right buying influence? We've seen record growth in our market the last two years - and for the last two years we've been running sigstr. Our sales cycles are very long and complex so attribution to one product is difficult but I don't think it's a stretch to say that at least some part of that increase in sales vs. 3 years ago (when we didn't have sigstr and didn't make plan) is definitely due to Sigstr. The idea of marketing through an e-mail signature is unique enough it can be effective. The idea that we are sending so many e-mails, specifically to potential renters or current renters, and we have a leave-behind with every e-mail is a wonderful opportunity....in theory any ways. I think we under estimated the time (and cost) it would take to have enough active campaigns in order to make a software tool like this maximize it's potential. Ease of creating design and templates isn't a "breeze". There is a considerable time and financial cost in order to design a campaign. You can outsource it to SIgstr, however that isn't a cost we (or most) want to assume. I would recommend having a graphic designer on your team, and then you can execute on campaigns at a much faster (and cheaper) clip. I think the idea of marketing specific sales goals through your e-mail signature is a nice concept. A completely honest review is that we haven't fully utilized the Sigstr tool for a marketing and sales channel opportunity. There are a lot of "cost add-ons" to utilize their software if you don't have a dedicated onsite team of designers, which makes it feel a tad bit like bait and switch. I will update my review after we've executed 2-3 actual attempts at sales through the campaign tool. We aren't....yet. The campaign's we've tested haven't shown to net any tangible results. We are going to ramp-up our efforts in 2018 and I will edit my review with any successes (or failures) realized. "Easy to use, solid basic functions"
It's pretty straightforward to assign employees to different groups and then have each group show a unique email signature banner. Good for personalizing campaigns. I would love to get more granular in showing different email banners based on the vertical, buyer persona, stage in the buying cycle, etc. that the receiver is in. More personalization would be great! Using a common marketing channel (email) to its fullest by utilizing the space within the email signature. We see it more as an advertising space rather than trying to generate leads, so it's been great to increase impressions of events or assets we promote through our Sigstr banners. 👋 Hi Jennifer – Thank you for reviewing! We’re glad to hear you are getting valuable use out of Sigstr. We do have the option for more granular targeting with our ABM functionality, which allows you to, as you say, show different banners based on the recipient’s vertical, persona, stage, etc. Get in touch with your Customer Success Manager to learn more! "Perfect tool to expand marketing reach and maximise engagement "
Best marketing tool and account team I have come across and it's surely a hidden gem in terms of using the most used channel (business email) to extend marketing reach and maximise engagement. "Great product to get your word out via your email signature "
I like that we're able to show a consistent message our entire company via their email signatures. The ability to show different messages based on different teams is very beneficially. For example, the message our sales team displays is vastly different than the message of dev team displays as they interact with different audiences. Connecting our google super admin account was a bit of a pain but once it was done it has been very beneficial. Best email signature software out there. We able to control a consistent message via our email signatures across the whole company and update them whenever we'd like. "Great creative tool with opportunities for growth"
Sigstr allows you to use your own designs to represent your brand. The metrics show you real-time click rates and views too. I also like how you can do internal and external campaigns. The internal ones are particularly useful for getting more reserved people out to company events. The employees at Sigstr always answer any questions I have (pretty quickly too). Overall a good up and coming tool for email marketing. The drawback of this program is there are still a few bugs within the system. When I brought these bugs to their attention, Sigstr employees handled it right away. In time, I’m sure there will be less and less issues. Also, depending on how fancy you'd like your signature to be, you might need someone who knows coding to help you. Sigstr is benefical to our marketing initiatives. If you're doing any kind of ABM campaigns, Sigstr is a must for your tech stack. The ability to attach an on-brand, totally personalized signature to each email you send is invaluable to our team. And it's EASY! I can easily set up and launch over 150 different ABM signatures in less than 90 minutes within the Sigstr platform. It would be great to have an in-platform banner builder for even quicker campaign creation. We create a lot of focused pieces of content for specific industries. With ABM functionality, we have the ability to get the right content in front of the right contacts in our outbound efforts. It's essentially another ad channel for us! "An Easy Way to Expand Your Marketing Reach"
We always have multiple marketing campaigns running at the same time. Sigstr is an avenue for us to easily expand the reach of our campaigns. We update our campaigns every couple of weeks, so it's a "set it and forget it" method of advertising that brings in quite a few clicks each month. It's also really nice to know that our employees' signatures are consistent in style. Finally, I can see that Sigstr spends a lot of time listening to customers. They're constantly asking for feedback and then implementing new analytics and features. We have trouble with campaigns not showing up for employees who use MacMail and the Gmail app. Sigstr has helped our email signatures remain consistent throughout our company. It's also an effective avenue for promoting new marketing campaigns to both our current customers and prospects. Sigstr is the answer to a question we didn't know we had. I ran into Sigstr at the Salesloft event last year and loved the concept. We started using them a month later and I no longer have to worry about what our team's email signature looks like or what links they present. We now have not only consistency of content, but also messaging. But wait, there's more... The messaging can be broken down into groups so the sales message can be different than the support message. Nothing that I can think of, this is really sound software. Support, when needed, was responsive. We now have a consistent message across all our users and groups. We're able to drive campaigns based solely on email signature content. "A Natural Inbound Marketing Layer in Your Content Campaign"
I’m a fan of robust, highly-integrated marketing campaigns—mostly because I’m your typical ROI junkie who looks for every opportunity to squeeze as much value out of every single effort. This is partially why we’ve embraced the power of 1:1 email by integrating Sigstr with HubSpot, thus extending the value of our inbound marketing campaigns. We're already investing in the content campaigns, which is the most time-consuming. Adding Sigstr to HubSpot JUST MAKES SENSE when we think about lead nurturing and customer evangelism. My only complaint about Sigstr is that we use a project management software called Teamwork, and because Teamwork doesn't support html signatures, we cannot use Sigstr for the electronic communications that come out of Teamwork. I'm hoping to change that! When we know from our HubSpot data that a specific person has a particular pain, we obviously nurture that person with email marketing and via social media and paid media efforts. We extend this value to our personal email signatures by running pain-based campaigns. Also, we have struggled with our own customers knowing all of the services we are able to provide. Sigstr supports our customer engagement and evangelism efforts. "Sigstr makes it simple to prove ROI from email signatures"
Sigstr has made it simple to change, track, monitor and update promotions throughout our company's workforce by allowing central control for email signatures. It's ingenious, really. The image limitations required due to various email clients are a bit problematic, but Sigstr does their best to make this easy for us. If you're looking for simplicity, unity and an ability to track, report and prove value from unifying email signatures, look no further than Sigstr. "Functionality and customization exceed expectations"
As a user, I am able to customize my audiences and their signature view easily. In campaigns, I am confident we can utilize Sigstr as a supplemental push with our marketing efforts. It's the little things that make a huge difference. At no fault of Sigstr's, we do not utilize their design capabilities as much as they offer. We often utilize our own custom pictures when designing a campaign. We are able to build out our campaigns and push different pieces of content and see detailed metrics on our campaigns. Benefits include detailed metrics, robust customization, and full control of what audiences see our content, both internal and external. "Sigstr has helped our outbound marketing tremendously! " Sigstr has helped on all fronts of our marketing. Our holdings company has 4 members and the system is so easy to customize groups and signatures for each company! At this point, i wish we could "force" employees to not change their signatures. That we could have full control, but that's more of an outlook issue. Be sure that you have visions on how you plan to use the software and what you want to market. It integrates with Hubspot which our company LOVES! We have solved many issues with trying to reach customers & prospects with marketing initiatives. It's made it easy to announce events, webinars, etc. I'm looking forward to the A/B functionality to be able to test different banners within one campaign. "Simple to add and modify"
I like having fresh content passively shared as part of my team's regular communications. It's easy to set up for individual users. Changing the content for the teams regularly and all at once gives us another method to target specific client segments/interests. Some reply-to messages look odd due to missing frames. Certainly worth considering as a method for keeping fresh shared content/resources. Make sure the admin of the system has a good grasp of what content to drive and can modify course quickly based on results. Additional marketing reach without the need for additional messaging. We were using another platform before we switched to Sigstr. The primary feature that attracted us was the fact that you can run campaigns beyond the usual signature. We're able to create groups per region and promote events. We also promote our content. My company has 13 offices globally. I'd love for them to add more time zone support to make it easier to schedule campaigns. Right now the default time zone is NY Eastern Time. Currently the time zone is for the entire organization meaning individuals users can't customize their time zone. The ability to have custom campaigns for events and content by region. We can have multiple campaigns running at any given time allowing us to personalize messages for different audiences. "Sigstr is leading the way in email signature marketing"
I love the support I receive and all the integrations available to me to customize content. the UI could use some tweaks, some things are harder to do than others like ending campaigns which didn't have a dedicated time window set up. Serving relevant content to prospects through email correspondence. We have seen additional traffic and lead generation to our gated assets. "Opening a new channel with email signatures"
I really like the ease-of-use with implementing new campaigns into the signature. Also, having full visibility on analytics & performance in an intuitive dashboard for performance is very helpful. I just wish I could automatically add in the signature campaign across the entire organization, as company wide adoption is still a challenge. Since we are using email as one of our primary channels for outreach to prospects & customers, we want the ability to promote new campaigns in an intuitive manner. With Sigstr, we can do just that, and also measure performance & results. We are looking to gain market share as a thought leader in Application Security, and we are constantly building on Awareness. Sigstr allows us to maximize on this via email channel. 👋 Hi! Thank you for reviewing, and we’re glad you are enjoying the Sigstr platform’s ease-of-use. We do have deployment options to set up Sigstr across an entire organization, with no end–user involvement. Get in touch with your Customer Success Manager to discuss whether this is an option for you & your team! "Sigstr: Taking Emails to the Next Level"
Sigstr's design services are exceptional. They are professional, listen to feedback well, and create quality campaign drafts fast. Also, they are great to partner with. They allow the customer to own the experience while implementing their email marketing expertise to help others get the most out of their banners. Currently, Sigstr only offers some analytical features that allow marketers to measure the impact of their campaigns. To take their analytics to the next level, they need to implement reporting that enables marketers to identify who is clicking on their campaigns. Fortunately, they do have plans to develop their analytics further. Once they do, their product will be a must for companies' email best practices. Consider having conversations with your IT stakeholders before implementing Sigstr. Their alignment is crucial for a smooth setup especially for larger corporations. Currently, we are trying to help build brand awareness in the marketplace. By utilizing Sigstr campaigns in the sales organization, we are able to drive more traffic to different events and keep our brand in front of prospects' minds. "Intuitive, easy to manage for unified company messaging"
Super straightforward campaign management enables our marketing designer to control messaging across the company with a single drag, drop, and click. Bringing on new hires doesn't even require them to do anything to get the signature setup. Love that. I'd love to see something like a Canva integration. We use Canva a lot to create signature designs and is a standard for us here internally. Would be an awesome partnership! We have Gmail, so just make sure they support the email clients you use—I am pretty sure they support almost all if not all! We use it to promote ebooks, coordinated ABM campaigns, and more. It's helped us get the word out about relevant launches, events, and more through a completely new channel. "Great brand consistency in email signatures"
The software is easy to use & ensures brand consistency across our team. We no longer have to be the brand police to ensure each person has the correct signature format and the most recent offers / banners to promote. We have had some challenges with the chrome extension not working based on our tech stack, which prohibits us from seeing the individual user information in the analytics. The team is great to work with and provide feedback around challenges and future product ideas. Sigstr offers us another place to promote relevant content and offers to the ecosystem of customers, prospects, partners and other business connections. The software is easy to use and tracks the impact and engagement of each offer. "Great way to market via an utilized resource"
The ability to change campaigns on the fly and segment by department is extremely beneficial. There are occasional outages where no signature displays, generally only for a few minutes at a time. Make sure to keep an eye on the analytics. There's plenty of learnings there. While we have focused on email marketing for years, we've only thought about it in the sense of mass sends. This allows you to extend a campaign in 1:1 communications so users see the campaign multiple times. * We monitor all Sigstr reviews to prevent fraudulent reviews and keep review quality high. We do not post reviews by company employees or direct competitors. Validated reviews require the user to submit a screenshot of the product containing their user ID, in order to verify a user is an actual user of the product. Hi there! Are you looking to implement a solution like Sigstr?